Some projects don't need to have a noble cause to better the world or make some aspect of daily life easier. Some projects are done just because you can, or it looks cool. Back in 2012, I worked on a group project for school with a simple task: Use a sensor and do something interesting. We decided to build a simple magnetic levitator to float a few magnets in midair, but there were parts of the project that I wasn't able to implement. The main feature I wanted to add was wireless power transfer. Wireless power works just like a normal transformer, except there isn't the iron core that's found in a traditional transformer. The physics, however, still work the same: current from the primary windings creates a magnetic field, which induces current on the secondary windings. The lack of ferrous material connecting the windings, though, means that the power transfer efficiency is significantly less. But let's see this thing in action! Unfortunately, it's still not perfect. There's still too much oscillation at times, but I think that's because the comparator circuit output is only off or on (even though they're short pulses). Another reason could be from using a single sensor, which is picking up both the magnetic fields of the magnet and the inductor, resulting in a slight error. I'd also like to transfer more than just a watt of power to the LED, but without tighter and cleaner windings, I'm not sure how much more power I could transfer without adding too much weight. If you'd like to build your own, check out the GitHub repository here. Have you ever worked on a project like this before? What kinds of projects have you worked on, just because you could? Let us know in the comments below. This wire is used when it is necessary to increase the amount of surface area without appreciably increasing the size of the conductor. I've been working on something similar to this actually. Everyone knows about BB-8, right? Well, one of the big problems with reconstructions is that the head is heavy and almost always pretty dumb. 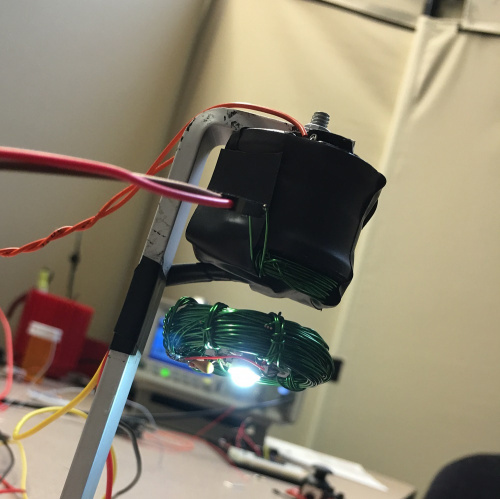 Using magnetism and wireless power transfer, you can add a camera and some image processing to the head unit without adding a battery or lots of weight. I've proved you can power a Raspberry Pi Zero (https://www.youtube.com/watch?v=A_yJUGsATo4) from a very basic wireless power module, and am currently working on making my own module to tailor the range to my actual robot. Coupled with a "floating head" I hope to have BB-8 run autonomously. Awesome post. I'm a bit stuck on the levitation circuit though: What kind of power are you pulling running this? I built this circuit part-for-part and I'm noticing that powering the FET drags the supply down considerably. The electromagnet has really low impedance at DC so this makes sense - I'm seeing my 12V supply drop to 0.09V at 3.12A when the FET is conducting. This also messes with the voltage on the rest of the circuit (since I'm driving an LM7805 to generate the 5V reference and it's source is dropping out). Next attempt is to use two isolated supplies for the decision making portion of the levitation circuit and electromagnet driving portion. Any tips would be much appreciated! The supply could be drawing too much current for a variety of reasons. The FET is controlled by the comparator circuit which compares the hall effect sensor's analog output voltage against the fixed voltage from the pot. Drawing too much current means that the voltage from the hall effect is too low, so more current is added to the inductor to try and pull the magnet closer to the sensor. To set the reference voltage from the pot, I would hold the magnet in my hand around half an inch from the sensor and with my other hand slowly increase the voltage from the pot until you feel the magnet start to lift from your hand. The levitation current should only be around 1A. But the current draw is dependent on the mass of the object your trying to levitate. Obviously the heavier the object, the more energy (ie current) will be needed. Hope it helps! Thanks for the reply Alex. My issues were primarily with the power supply. The DC resistance of the inductor and the on-resistance of the FET are really low. As a result, supplying 12V would result in some ridiculously high current. My supply was going down to 0.09V and 3.12A. The 12V was also powering the LM358, so when the voltage dropped it was no longer functioning properly. I isolated the problem by using separate power supplies for the FET/electromagnet and the rest of the circuit and that was able to fix the problem. As a side note, I did notice that the resistance of the electromagnet significantly increases as it heats up. At that point the supply can push 12V 3A. The demand on the supply significantly reduces its slew rate so for anyone else with this problem I found it worked best adding a 4 Ohm power resistor in series with the electromagnet. What is the part number for Q1 & Q2? Any logic level N-Channel FET should work, but I used these. I have actually had fairly good success pushing 5 watts plus wirelessly using a flyback inverter style circuit. I have a schematic of this in the instructions to kits that I sell. The instructions are available for free at the link on this page: https://bfieldlight.wordpress.com/2016/02/18/hobby-kits/ I don't know how the electromagnet circuit will react to the wireless power at this wattage, but since it is fairly stable and high frequency, so it may not influence the feedback circuit too much. The square wave input was coming from my function generator. You could replace the function generator with a 555 timer and use a pot to sweep through frequencies though. D1 is used to protect the source from high voltages created by the inductor. I used a 1N4007, but any rectifier diode will work. Same with D2, it's a half bridge rectifier so another 1N4007 should work, but I used a 1N4148 because it was smaller. Anytime you use an IC it's good practice to have at least a 0.1uF cap near the supply pin to smooth out any ripple on the rail. I could have connected the cap directly to pin 4 and 8 of the LM358, but for aesthetic reasons I placed it nearby with the note. Thanks, I understand it better now. I've got parts ordered and I'll google around for making a generator with a 555. This definitely ranks way up there in the cool factor. Cleaned up and with professional packaging, this is something that I would expect to see in a science museum gift shop. For those without a bench frequency generator, would you have any suggestions in regards to using either the Frequency Generator Kit - FG085 (KIT-11394) or SparkFun MiniGen - Pro Mini Signal Generator Shield (BOB-11420) to generate the square wave? Even a 555 timer will work. You really just need a way to adjust the frequency to drive the gate of the FET. But the other products you've listed will work too. I have tried the 555 method through a FET, which works great, and even better if you match resonant frequency well between your coil and a capacitor in parallel. Frequencies around 100 khz work well. The transistor used in this way does tend to heat up from being slammed on and off hard, which is why I switched to the flyback circuit, in which gates of the transistor are held just open enough to trigger on and off as a multivibrator at the coil capacitors resonant frequency. (see link to kit instructions as I posted above) This even does a good job of matching mutual inductance of your transmitter receiver pair. It does tend to work as an induction heater if you have a tight coil though or high permeability core or close proximity unloaded resonant receive coil. Awesome! I'm glad you were able to get it to work. That's something I should have mentioned in the video. Both primary and secondary should be tuned properly for maximum power transfer. The FET shouldn't be over heating when the gate is saturated though, because Rds should be in the milliohm range. A mosfet driver should help with thermal issues.